Gains in Dangote cement and banking dominated chart keeps Trading activities on the floor of the Nigeria Stock Exchange afloat on Thursday, as the All Share Index soared by 1.98% closing at 31,433.49 points as against the previous close of 30,821.80 points. Furthermore, Market capitalisation grew by 1.98% closing at N11.722 trillion, as against N11.494 trillion of the previous trading session. Volume and value of traded stocks appreciated by 21.63% and 21.79%, to arrive at 436 million units and N5 billion respectively. 25 stocks closed positive,while, 13 stocks lost, these bring the market breadth to a positive round off. 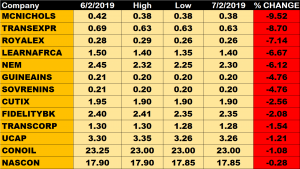 Forte Oil led other price percentage gainers closing 10.00% above its previous close of N27.00 to settle at N29.70. 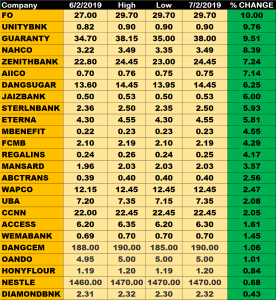 Unity Bank, Guaranty, NAHCO, Zenith Bank and AIICO, all made it to the gainers table, growing above 7.00% of their last share prices ahead of other 19 stocks on the gainers’ chart. MCNICHOLS tops the losers’ table, Shedding 9.52% of its share price. This is followed by Trans-Nationwide Express, Royal Exchange and Learn Africa all shedding 8.70%, 7.14% and 6.67% respectively.